What a difference the sunshine makes. After 10 days of mist and gloom, I awoke today to glorious sunshine. I decided to have a hearty breakfast for a change and head off to the seaside. Breakfast was good, scrambled eggs with mushrooms and some type of local cheese. In the menu it was called, “French Conneggtion”. Very clever, very nice. I got to the seafront around 11 am and it was reasonably quiet. 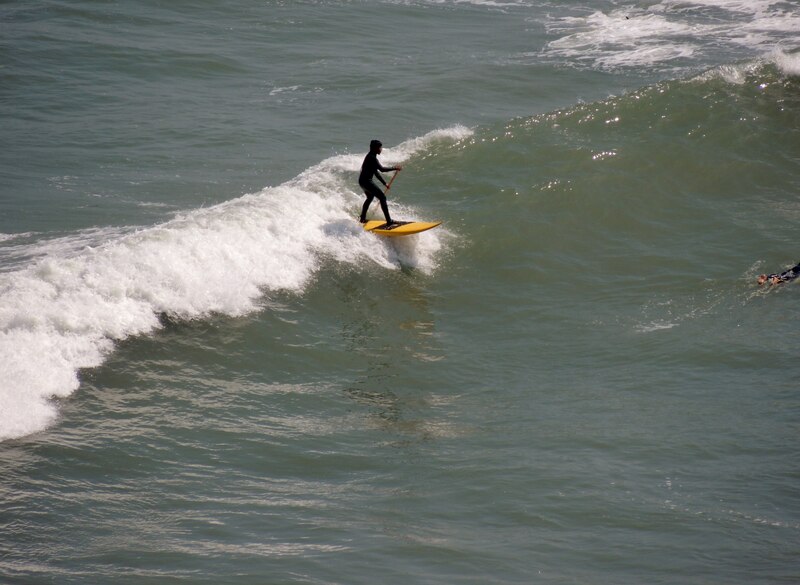 But the attraction of a sunny day at the seaside was too good to be missed for many. The rather bleak and almost empty place that I had visited the week before was transformed. Local families, tourists, skateboarders and runners were filling the park areas. Street vendors appeared and the taxi rank became full as the taxistas dropped people off and then waited hopefully for a return fare. The restaurants started to fill up rapidly as lunchtime approached. 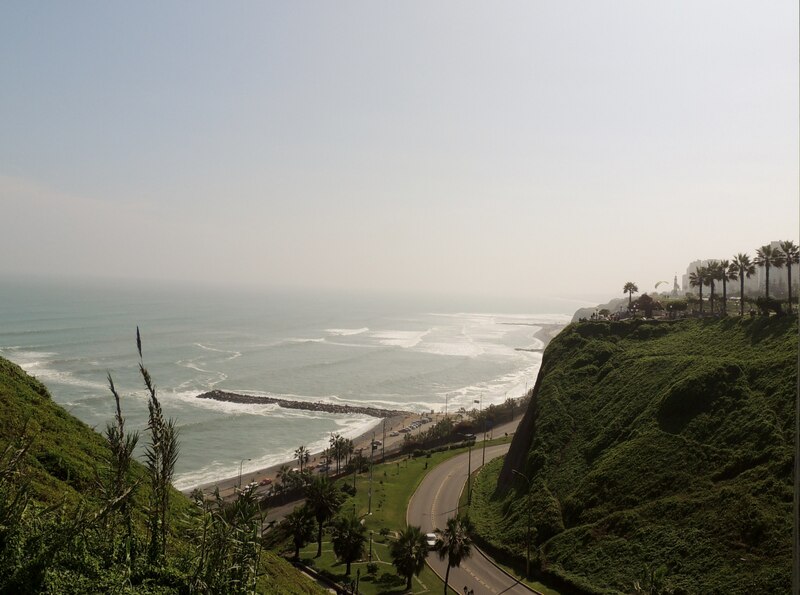 Now I can see the attraction of El MaleAcon in Miraflores. . Apart from the parks and the restaurant area, there is action taking place in the sea and in the air. Although the air did appear somewhat congested at times . 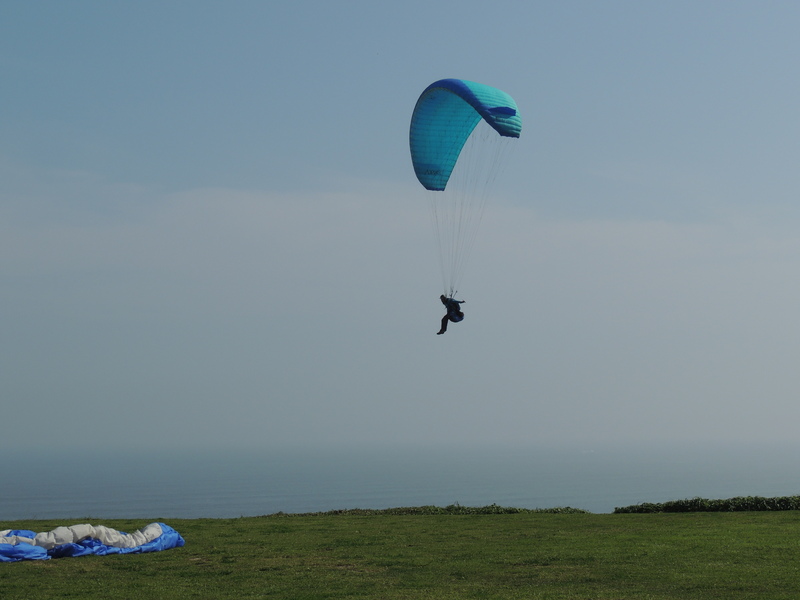 There was a queue of paragliders waiting to take off. It was like a bank holiday at Gatwick Airport. . I did not see any pilots come to grief but there were some close encounters. It is not one pilot with two chutes, unfortunately the other one is just out of the shot. Probably, fortunately for him, as they looked to me to rather too close for comfort. 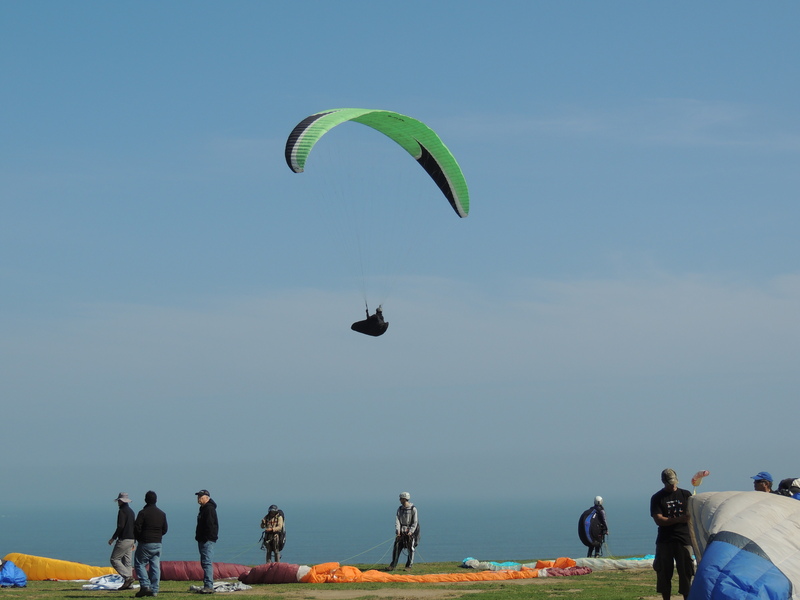 As exciting as it looks, don´t expect any aerial shots from me in a paraglider. 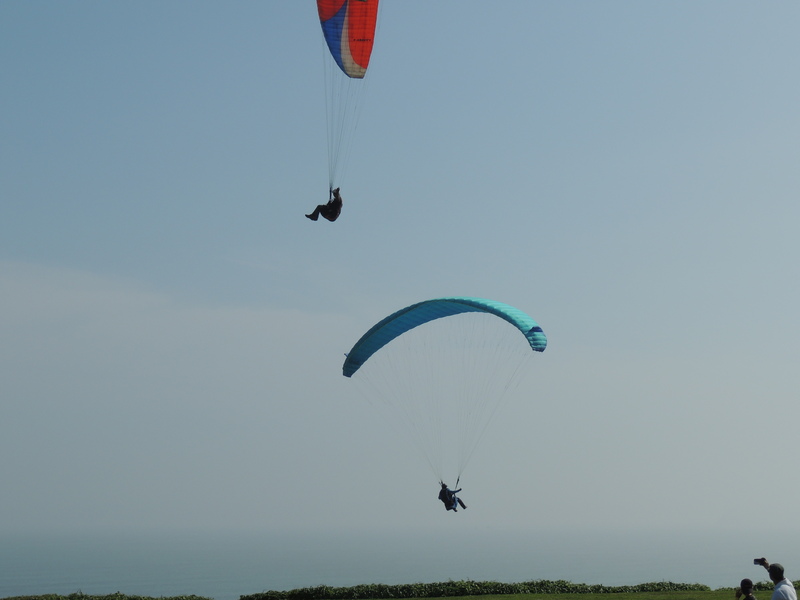 They do take people up on tandem flights but unsurprisingly, I did not see any. According to a local woman, the area has also got an attraction for those who, having become disillusioned with life, decide to jump without a chute . 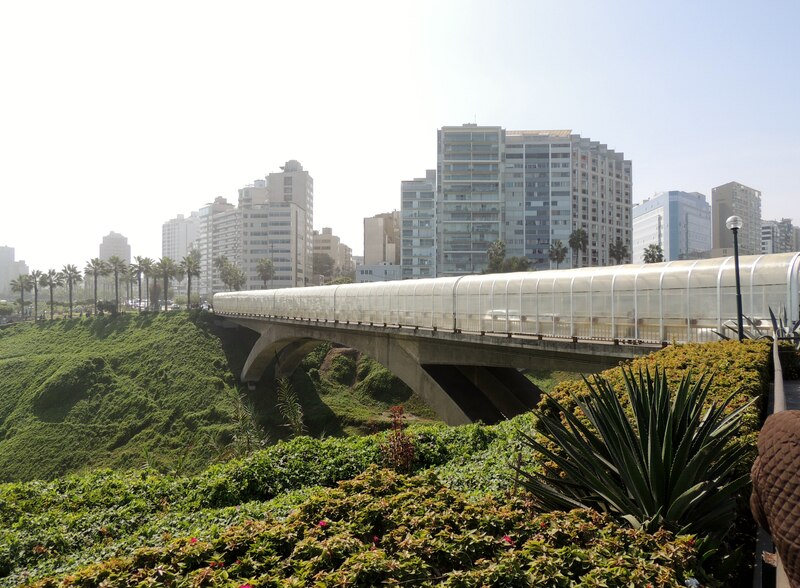 The authorities in there efforts to deter this, have erected canopies on both sides of the bridge . 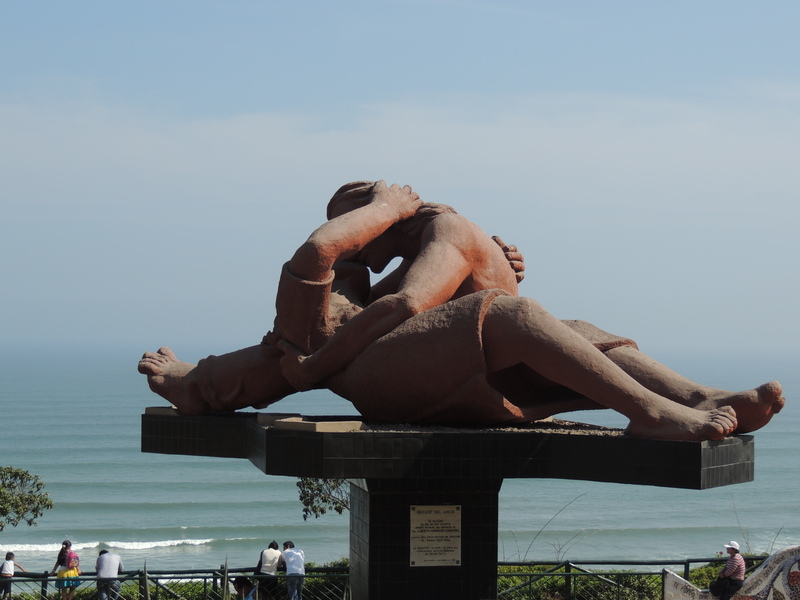 A bit further along from the bridge is El Parque del Amor, a park in which, after dark when all the families have gone home, lovers come to the park to do whatever it is that lovers do in parks. There is even a huge statue to celebrate this fact. After such a tiring day, I went to the Lima suburb of Jesus Maria for my evening meal, in search of a restaurant serving typical local dishes. I had a nice meal of trout with golden potatoes and a delicious salad, accompanied by a cold beer. As tasty as the meal was, the occasion was marred by the clumsy attempt by the waiter to rob me of some of my change. The irony is, that what he tried to take from me, was less than the tip he would have received. 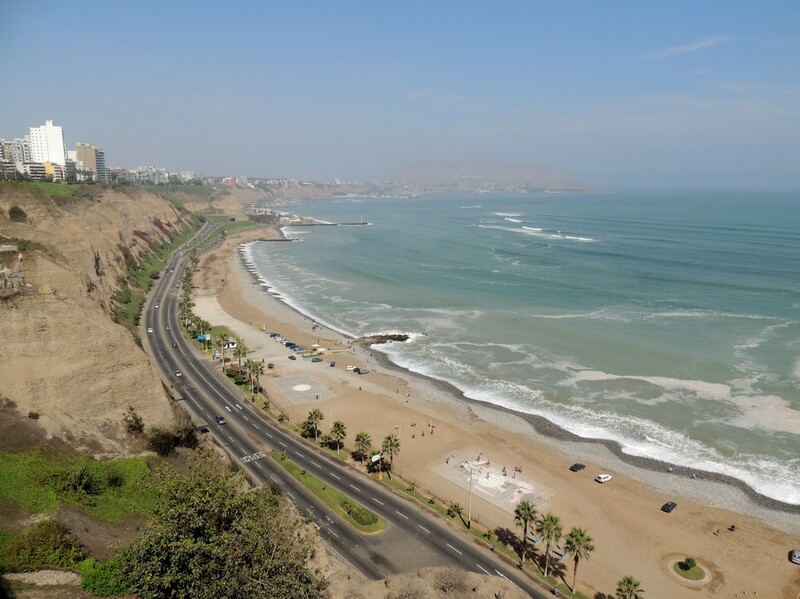 Nevertheless, for me, it was a good day to experience Lima in the sunshine. 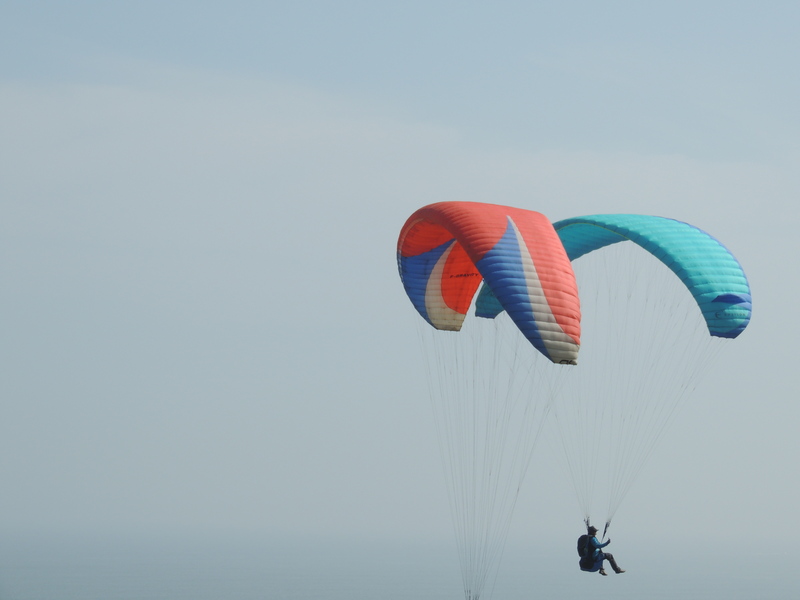 This entry was posted in Recent Activity and tagged El Parque del Amor, Lima, Miraflores District Lima, Paragliding, Peru. Bookmark the permalink. Maybe,Jen, but after some of the recent encounters I have had, I’m reluctant to ask anyone to a take any pix of me in case they get the wrong idea. True. If you see a family ask them to take a picture, rather than a single person . should have got a camera with a timer on it you silly billy!! The timer determining how long before someone runs off with it? Well you do have to use a certain amount of common sense Pedro, you rurry iriot! !